I believe that mad Baggins is off again. But nobody will read the book, however it ends. .So it happened that there have been no fewer than two places in this world I can call home. The excursion turned out to be a return. Between consecutive points on the map there was a road, sometimes curvy, sometimes straight, which I was on in good company, yet in fact on my own. New places that you so much want to reach seem suprisingly familiar. Stories are repeated, different ones for everyone of us. The long-planned, much-awaited trip becomes a myth before it is even started. It is as if we were going to shoot a movie on an island. Everyone plays their role in possibly most sincere way, realizing a screenplay written down, though unread. At the same time we consider playing a role and actually being the character. Perhaps this is because you are to see Leaf by Niggle staged in Livingston and are afraid that it would end up being a flop, as if its success depended on you? I boarded the train to Bree at 4:02 p.m. on Mon. 2nd May of 72nd year of the Fourth Age of the Middle-earth. I was willing to feel some change: it was running as fast as in the previous year, but clearly with fewer passengers this time, most of them asleep, occupying more than single seats. Someone was reading the book Życie na pełnej petardzie. I was left alone with my thoughts, obeying the rules of the so called silent railway car. The thoughts were on the loose, since the world outside was not yet watchable. The inn in Bree was still there. We had a warm reception and were given practically the same rooms as in the previous year. A comfortable bed and the same window view, no rain. I was ready for some dreamless sleep. It was necessary to sleep fast and without problems. The right scenario was still to be realized, but it was already clear to me that certain things must be repeated, because that is what we choose. Such is the ritual which makes the journey more meaningful than just an ordinary tourist escapade. On 3rd May I woke up at 4:30 a.m. I grabbed a bag with cucumber sandwiches (how did they know where I was going to?) and sleepy-eyed I went to the assembly site some three minutes away from the hotel. Right there I met a band of ladies who were going with us. I could call them noble daughters of the renowned Old Took from the Great Smials. They were later to prove their knowledge of arts and crafts, botany, human nature, value of friendship and good humour. We set off at 6 a.m. 2 hours and a quarter later we were in Wrocław where the lacking four participants of our trip joined us. Only one of them had not been on the Island before: Whitewater – artist, vocalist, more an elf than a woman. She never parted with her bottle of hot tea, except when she generously shared it with others like me, for which I am thankful as at least it was something to flush down my water with. If this year’s touring party makes a plot for a new tale, it is made of two threads. One is those who have been on the already legendary journey of 2008 and saw the Lord of the Rings musical in London, then collected the pieces of Balrog scattered in the venue and brought from Oxford the seedlings of Tolkien’s favourite black pine. The other is the people who last year cruised between Oxford and Glastonbury looking for traces of Tolkien and previous trips. A certain member of the latter took with her a part of her family who had not yet taken part in any search for Tolkien memorabilia. Surprisingly enough, they brought an artistic flavour and even more Tolkien in the trip, but let me leave it for later. Also there was a cheerful next year’s high school graduate and therefore the personal composition of the 2015 trip was somehow continued. We headed for Aachen. The landscape was running back fast, as if it was given a backspin. Galadhorn tried to stop it by telling us stories of Slavic inhabitants of Lusatia and of Mirkwood that used to cover a vast part of Carpathia and posed a natural barrier for or against people and their affairs as well as a source of legends. Due to eco limitations of our coach’s engine we were unable to enter Aachen, a city of Celtic past, the ancient Roman resort (Aquae Grani, from Granus, the Celtic healing god) with e.g the cathedral where Charlemagne himself has been buried. Then Galadhorn claimed there was nothing interesting to see there there and begged us for no regrets (which is a good thing, come think of it). I am sure it is not easy to be a tourist guide, especially when you personally know the tourists and they know you, for a long time. It is even more difficult when you need to convince the people that they do not want to visit something at all, although that has been in the itinerary (and you are aware that some of them can write a complaint). Well, unless they are not tourists, but travellers, who do not watch the world, but let it observe themselves. Who needs a tourist guide then, though? The hotel on Belgian side of Aachen was decent and served good breakfasts. However, the bathroom was not a place for strait-laced people, which had somehow become typical for such trips. We balanced on the edge of humour and silence. In the room I got acquainted with Marille, a member of editorial staff of AIGLOS. Marille talked much and was good at it, so I could keep silent, still being involved in the discourse, at least I hope it could be felt, and Marille asked a lot questions. I wonder which daughter of Old Took could Małgosia be: Belladonna, Mirabella or Donnamira? On Wed. 4th May we headed for Dunkirk, watching the charming French comedy Bienvenue chez les Ch’tis on our way there, while outside it was not funny anymore. The nearer to the port, the more police, soldiers, wire entaglements and individuals with rucksacks trotting along the roadsides. Both the latter and us on the move, but nobody waiting for them… Writing these words I am looking on pictures of Tom and Kate from Barcelona’s Güell park. On the park map board someone wrote TOURIST GO HOME. Such are the times, I think to myself, that many of us would like everyone to go back home to live there, each with their own problems that we have more and more of, although we do not share all of them. Anger is a universal thing nowadays. British people have just voted in favour of Brexit, but it seems this was only a background issue. History repeated itself: in front of us were the white cliffs of Dover. Tol Eressëa welcomed us with sunny sky, wind and cries of the seagulls. Same view as last year! – It’s a castle over there? – Yes, on that hill it’s the Dover Castle. I was trying to be helpful, but would not take the tour guide’s work away from him despite that being difficult due to the excitement I felt with the cliffs in front of me and salty wind blowing in my face. The start of the journey lay ahead of us. Dover took us from the ferry and led us into Kent, straight to the Leeds Castle near Maidstone. We reached the castle right after teatime, but they still waited for us with the tickets. A polite elderly gentleman at the entrance advised us to be quick if we did not want the castle’s door to be closed just in front of our noses. So we hurried unhurriedly, to have enough time to admire the view on the vast park full of brooks, big trees, flowers, geese, ducks and worms. The special light of this time of day enabled us to photograph everything, as if we would not like to miss something. Some of us adopted strange horizontal postures on the thick and soft English grass that let them capture good shots (of interesting insects, as I heard). The castle is located on an island. It has been built by king Edward for his wife Eleanor of Castile. The 900-year-old walls have never been uninhabited. They contain a museum full of decorations, furniture, paintings, books, flowers in big vases etc. – all from the 19th and early 20th century, apart from the flowers, of course. There is an impressive library lined with volumes bound in canvas or leather, sapphire blue sophas and a delightful portrait of the last lady of the house and her two daughters (clad in beautiful dresses in various colours of the sky, with large window and a view on a park in the background). Ladies may be moved by a big portrait hung above a fireplace of the proud king Henry VIII, who had his wives lovingly beheaded, as well as by a glass case containing period shoes (not the former possessions of the aforementioned wives, though). In the dining rooms there are tables ready for meals, but serving is highly unlikely. However, our party was dragging on through the chambers so slowly that all the personnel managed to leave the museum except for one guard keeping an eye on us, the forever young Tolkienists. Once we left the castle, we were practically alone in the park, nevertheless (or because of that) we decided to stay there a little longer and to sort of peep through a few keyholes, e.g. to the maze, or to listen to falcons kept in the aviary. Others made photos of amazing bushes and hedges in the garden or shopped for last minute gifts for the doggy aristocracy. I walked past a holly. The plant is in the crest of the elves from Hollin, who lived in friendship with the dwarves from Moria. Hollies grew in clusters along the path leading towards Moria’s western gate. The two trees on its both sides were hollies, too (speak, friend, and enter!). They were treated as boundary markers. According to Gandalf, the gate was mainly used by the elves of Hollin, in whose opinion the land in front of it belonged to them. What I found the most memorable thing as far as that place is the light comparable to a golden mist that the park and we in it were shrouded. Shapes and elements of landscape were visible, but outlines were blurred. Hard to describe and to photograph… We were slowly approaching the exit, almost losing our track at the crossroads and looking back on the castle, lake and island. I had a feeling that each of us was walking partly with the others, but in a significant part also by and for ourselves, so that we would miss no important moments. Very slowly we came to the exit, which was… closed. Luckily a narrow gate had been left open for us. The English rule of not embarrassing anybody rescued us from the nice trap. The previous trip had started in Canterbury. I dug in my memory and photos: the same blue sky and light, and thought of the powerful king whose one dramatic sigh and a few angry words spoken to his fervent supporters condemned to death an influential clergyman. Therefore some parallels could not be avoided, some of them even seemed to be purely non-accidental. The day ended at Ibis hotel in London Thurrock. In a ground level room I enjoyed the company of Zuza (the youngest member of our team, scout, sailor carrying a boatswain’s whistle, future actress) and Whitewater the vocalist. We sat long into the night over Guinness pints and slender glasses of Strongbow. The morning of Thu. 5th May was unbelievably idyllic. After a good breakfast we spent a few hours in boats on the River Cam in Cambridge. The attraction is called punting and involves something between comfortable sitting and lying in a flat-bottomed boat among ca ten people, cameras in hands and eyes wide open towards the river bank with grey Gothic academic buildings separated by light green meadows with brown cows grazing on them. Silent swans were passing the two boats we were in that were moved synchronically, similarly to the Venetian gondolas, by students with long poles in hands. The latter were rather silent as well, maybe they found it strange that we admired the Bridge of Sighs stretched over the river. Flies and bees were buzzing, birds were singing. The half an hour we spent in such a marvellous way was definitely far from enough. Nothing under the sun should happen more quickly than the majestic boat ride on the Cam. Yet we needed to go back to the river bank and keep moving, this time to the Fitzwilliam Museum. The institution celebrating its 200th anniversary offers free access to a rich collection of paintings and antiques, Egyptian and Greek in particular. The refined classical building has plenty of rooms. It welcomes visitors with colourful marbled staircase surmounted by a dome. We got an hour for an individual visit, so I took a map and went to find my three favourites, as such is the best strategy for every museum in the world. In order to see anything it is better to see less, but examine the objects as closely as possible. On the wall nearby there was a landscape by Pieter Brueghel the Younger, a very vivid depiction of a feast in a Flemish village. There is a wandering theatrical troupe, soup cooked in a big pot, dancing, food, pitiful results of gluttony and drunkenness – and each piece might be a separate story. Had they known it, the Brueghels could have painted Shire. I skipped the Pre-Raphaelites and looked at the young Dorothy Barnard painted in 1889 by the excellent American portraitist John Singer Sargent. A wonderful portrait of the not quite childish child showing the spectators her interesting profile, quite short chestnut hair and white shirt with yellow topping and some darker pattern. I am not sure why I have chosen that work of art. Likely because the child was sad and too solemn. The author had custody of the girl and her mother after their father and husband had died. Every time I visit a museum, particularly of art, the thought haunts me that we tend to squeeze all manifestations of genuine beauty into confined spaces created specifically for them, depriving ourselves of chances to commune with them (what is beauty for if we have design?). We make quasi-sacred places, modern substitutes of shrines (whereas sometimes in real ones there is no trace of beauty). The creaking wooden floors, smell of dust, glass cases with lots of pottery, tapes and fences, ladies and gentlemen in elegant uniforms controlling every step of the visitor and resembling some characters from computer games – all of that boils down to atmosphere of a tomb or crypt. We wander across lifeless art reserves that have lost all the power of inspiration because the objects gathered there have been taken out of context. Perhaps it is strange, but the sole thing I still remember from the Fitzwilliam Museum is the cacophony of tuning of the grand piano kept in the corner of the biggest hall. In the end I visited almost the entire museum, which I had first decided no to do, because I forgot where I had put my raincoat (completely useless in that sunny weather). I found it close to the entrance after an intensive three-minute search. Therefore we could go to the centre of Cambridge. A state of emergency stopped operations of the King’s College Chapel ticket office for a few minutes and allowed us to see how the local rescue unit was prepared to act. We dispersed around the chapel, as close as possible to the big meadow nearby. Gusts of wind made the May heat more tolerable. The wait (and partial renovation of the interior) was compensated for by the picture of the Three Kings’ bow painted by Rubens himself in 1634 for the nunnery in Louvain in Belgium. In Exeter College chapel in Oxford there is a tapestry depicting the same scene, as imagined and painted by Burne-Jones. In Middle-earth there are no coincidences. Professor Tolkien visited Cambridge quite late in his life, mainly for academic purposes, and he openly regretted that he had not earlier got to know King’s College. 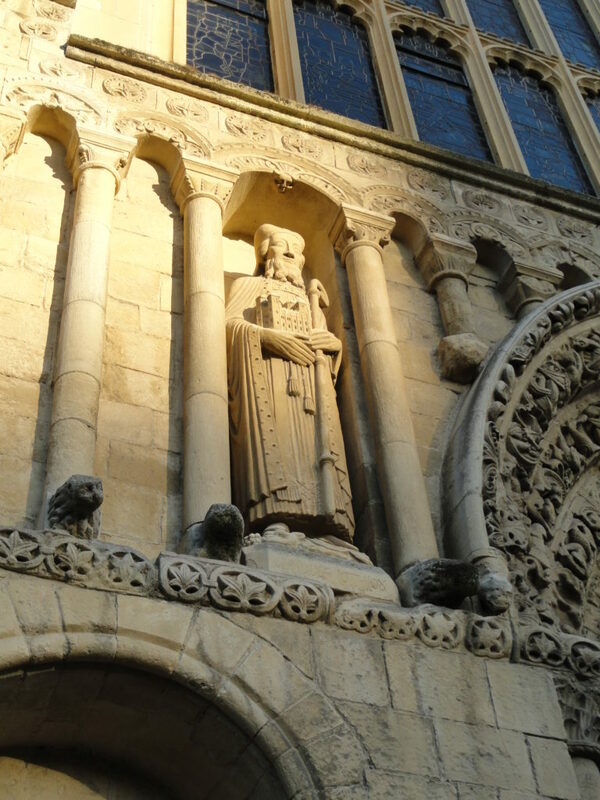 Tolkien was in Cambridge between 8th and 15th May (sic!) 1954, just before The Fellowship of the Ring hit bookstore shelves, as an elector of the dean of the then newly created Chair of Medieval and Renaissance English. Influenced by Tolkien, Clive Staples Lewis was subsequently elected for that, although he had not applied at all. Initially C.S. Lewis did not want to accept the title, but he agreed in June 1954, again encouraged by Tolkien. It cannot be forgotten that Tolkien’s friends from T.C.B.S. (Tea Club/Barrovian Society): Robert Quilter Gilson (1893-1916), Geoffrey Bache Smith (1894-1916) and Christopher Wiseman (1893-1987) all studied in Cambridge. We left King’s College behind and began spending our free time. I went for a walk down the main street and popped in a bookshop, which I always enjoy doing. Hunger prevailed, though, so I eventually found myself over a cup of coffee and a healthy humus sandwich in a cafeteria inside… a chapel. The place of prayer and worship was only about five metres away from the coffee table. Maybe this is how it should be? The bus call was a little delayed, because Poicëlle had to wait at Waterstones till the relaxed staff found a book requested by her Mum. But who could be angry for that…? 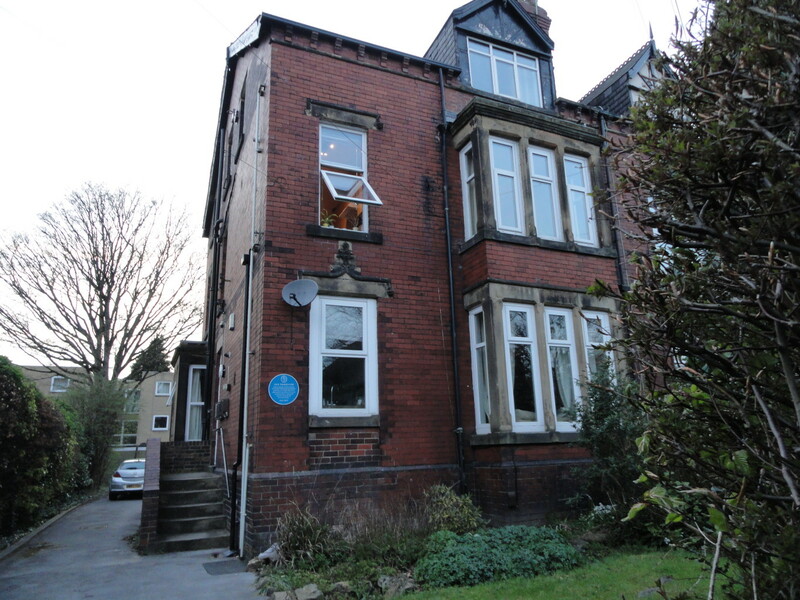 Next we drove to Leeds, where Tolkien briefly lived and worked at the university in the 20s of the 20th century. We parked the coach near the university buildings and passed two of the four former Tolkien’s houses of which one does not exist anymore, so we had to exercise our imagination. Where the house used to be there are a few middle-sized blocks of flats. Galadhorn went into an adjacent beauty salon to ask where the house had been and got a fairly precise description. It seemed as if for the locals the red brick buildings with all the everyday life going on inside and around them was something like Matrix. Walking down the street one came across an outlandish view of an old church and abandoned cemetery overgrown with blue flowers. from 1924 – 2 Darnley Road, West Park – a sizeable two-storey red brick house marked with a blue plaque, still were it was built, in a villa quarter, actually at the outskirts of the city; Christopher Tolkien was born there. Standing in front of the house we posed for a group photo and since that moment we have been the only people in Poland who have seen (nearly) every Tolkien’s house. In the room on the first floor (probably it was kitchen) the light was on and the window was open, so even if the situation was sort of uncomfortable we just wanted to look. Incidentally, all existing former Tolkien’s houses are currently in private hands, then a potential location of his museum would have to be found elsewhere (if such is needed at all – and this should be discussed separately).